I hope you all have been getting your Fall baking in. Can you believe that Thanksgiving is ONLY 13 days away? O.O After Halloween the days just seem to speed on by. Well, to celebrate the season and get you guys ready for some Thanksgiving fun- I've got some amazinsg cupcakes for you guys. The DIY video is just as fun as these cupcakes and is uploading as we speak so don't forget to visit the Youtube Page for the full video. Step 1: You'll need- Cooled cupcakes, fondant, buttercream, caramel sauce and an appetite. To prep, you'll need fondant in colors: green, orange, yellow, brown and white. Step 2: Peas & Carrots- Roll small amounts of green fondant into little balls to create peas. Take the orange fondant and either break off pieces to form small cubes or carefully use a knife for more precision. Make sure your knife is sharp or use a razor blade. I'd recommend shaping the cubes by hand. 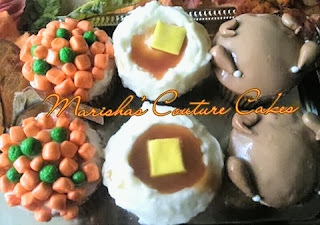 Smear a little frosting on top of your cupcake and randomly place on your peas and carrots. Step 3: Turkey time- Roll out the brown fondant until it's considerably thin and by using either a circle cutter or drinking glass (about the same circumference of the cupcake) cut out circles. Spread a little bit of frosting over your cupcakes and place the fondant on top. Create the neck line of the turkey by making a small indent on one side. Step 4: Shape small pieces of brown fondant into cones. You'll need 4 cones per cupcake to create the wings and legs. Take two of the cones, pinch the larger end so that it's flat, and bend the pointy end upward (these are your wings). Glue each piece on with a little bit of water like the picture below. We also made two tiny sized balls out of white fondant and stuck them to the tips of the legs to create the turkey bones. Step 5: Mashed Potatoes with Gravy- Add a little bit of fondant to your frosting to create a "chunky" affect. Using a small slanted spatula or butter knife add your frosting while creating a small space in the center for your "gravy". Using your favorite caramel sauce, spoon a small amount in the center. Roll out your yellow fondant, and cut in small squares to create the butter and to finish those tasty taters off.